The Phoenix Mercury now have an opponent in the 2014 WNBA Finals. But can the Chicago Sky compete with the winningest team in league history? The Chicago Sky didn’t play particularly well in Game 3 of the Eastern Conference Finals, but the Indiana Fever just played worse. And with Elena Delle Donne playing just 3:17 in the second half due to apparent back spasms, we can’t even say the Sky were capable of putting their best foot forward. In stark contrast to the thrilling conclusion to the Western Conference Finals last night – and perhaps emblematic of the gap between the WNBA’s two conferences this season – the East’s representative in the 2014 WNBA Finals was determined in ugly fashion as the Sky won another elimination game on the road to advance by a margin of 75-62 (box score). Although it was Allie Quigley who led the way for Chicago with a game-high 21 points, it was Sylvia Fowles who took over the game in the fourth quarter to keep the crowd from getting into the game to buoy Indiana. The 6-foot-6 Fowles scored 8 of her 17 points in the fourth quarter to help the Sky mount a 14-point lead — the biggest of the game — and coast rather easily to a win as the Fever were only able to muster 3-for-14 shooting (21.4%) in the final period on their home floor. Unfortunately, things didn’t go much better for the Fever in the third quarter than they did in the first half. Despite having just one turnover, the Fever shot just 35.3% in the third quarter and still could neither hit a shot nor turn their considerable rebounding advantage (11-4 in the third quarter alone) into points. Shavonte Zellous was really the lone bright spot for the Fever but only shot 2-for-9 in the second half to score 6 of her team-high 16 points. 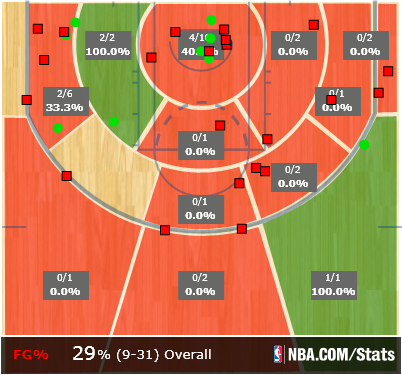 The Indiana Fever’s second half shot chart in Game 3 of the Eastern Conference Finals. It’s really not a stretch to say that if the Fever had just shot better at any point in this game they might have won this one and advanced to the Finals to set up a rematch of one of the 2009 championship series, widely considered the best ever or at least a high point for the league. For the Sky, they were unpredictable entering the playoffs due to the injuries they’ve dealt with this season and have now broken new ground by winning the franchise’s first-ever Eastern Conference title after facing two road elimination games. Fittingly, their matchup against the Phoenix Mercury in the WNBA Finals isn’t exactly predictable, although they’ll be heavy underdogs. The Sky lost both meetings to the Mercury during the regular season but played without both Elena Delle Donne and Courtney Vandersloot in those games – so just as we’ve been saying all playoffs, it’s hard to say exactly how this Finals series will look like even if we assume to know what the final outcome will be. Click here for a quick rundown of the first half. 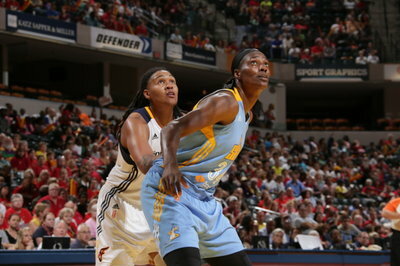 For more on this series, check out our Fever vs. Sky storystream. Yes, Chicago will win a game, maybe two. But the Sky won’t win the title. Yes, Chicago’s winning the WNBA Finals!